Today, we are excited to announce the general availability of Visual Studio 2019 for Mac – the next major version of our .NET IDE on the Mac. This release is now available as an update in the Stable channel for existing Visual Studio for Mac users, and new users can download and install it today as well. You also can learn more about the new capabilities in this version by reading our release notes. Visual Studio 2019 for Mac focuses on improving the core of the IDE, setting a foundation for us to bring new capabilities to you more rapidly with future updates. In this blog post, we want to highlight some of the new capabilities included with this release which have been shaped greatly by your feedback. Thank you! In addition to general improvements to the IDE, we have also introduced several improvements for developers building mobile apps using Xamarin, games using Unity, and web applications and services using .NET Core. So, let’s get started! The code editor in Visual studio for Mac has been completely replaced with a new editor built on a shared core with Visual Studio on Windows, and with native macOS UI. Not only does this provide an enhanced experience with smooth editing and navigation, but the new editor also has all the powerful IntelliSense/code-completion and quick fix suggestions you expect from a Visual Studio editor. Furthermore, we have added support for bi-directional text, multi-caret, word wrapping and much more that you can read about in greater detail here. We are busy adding a last few finishing touches to the editor and hence the preview editor is only available for use when you opt-in. To enable the new editor, navigate to the Visual Studio > Preferences… menu, Text Editor > General section and check the Open C# files in the New Editor checkbox. Stay tuned as we work towards enabling it for C# and XAML, with other languages coming shortly thereafter. 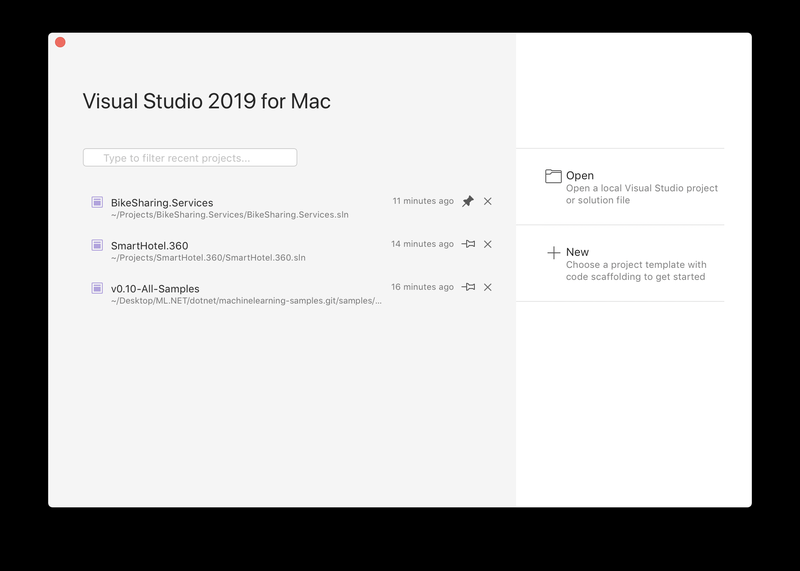 With Visual Studio 2019 for Mac, we’ve introduced a brand-new way of interacting with your projects and getting you where you need to go in the IDE. The Start Window allows you to quickly create new projects or conveniently search and navigate to a project you might have previously opened in the IDE. Visual Studio 2019 for Mac allows you to easily launch multiple instances of the IDE from the macOS dock, enabling you to work on multiple solutions simultaneously, one per instance. Developers run though the “build, deploy, debug” cycle countless times in any given day. As we continue working to shorten the inner development loop, we’ve made big gains in trimming down the time you spend building and deploying for Android, so you can focus on creating amazing mobile apps. Say goodbye to all those build-time coffee breaks! A full report of build performance profiling, as well as methodology, can be viewed on the Xamarin.Android wiki. We have ported the Unity debugger from Visual Studio on Windows to the Mac. Beyond making it possible for us to apply fixes across both products at the same time, this new debugger provides better compatibility with older versions of Unity and a better experience when debugging unsafe C# code. We have made a significant number of performance and reliability improvements in this release across the board. In particular, the C# code editor, Git support, Xamarin, and.NET Core debugging should all be significantly faster and more reliable with this release. This release also includes more than 200 accessibility related fixes that move us closer to our goal to be completely accessible on the Mac. As we had previously called out in our roadmap, our near-term priority is to enable the new editor for C#, followed by other file extensions. Beyond that, we are bringing over the Xamarin Forms XAML language service from Visual Studio on Windows to the Mac, adding support for multi-targeting, solution level package management and file-nesting support for ASP.NET Core. Stay tuned for future Visual Studio 2019 for Mac updates! We strive to be 100% driven by your feedback and we love to hear from you, so please do share your feedback and suggestions. Thank you for helping us shape Visual Studio for Mac. We look forward to you downloading and using this new release. The upgrade to VS 2019 Mac went smooth. Looking forward to using the new and updated features. Cheers! Thanks for your feedback, Hemant! Let us know if you notice any issues or have any feedback - we will definitely appreciate that! Thanks for your feedback! We do not have immediate plans to add C++ support to Visual Studio for Mac, and want to remain focused on delivering the best possible .NET experience on the Mac that we possibly can. We will re-evaluate this decision in the future once we have made significant progress on our .NET goal. Thanks for continuting to vote on that Developer Community suggestion as it will help us understand what we should prioritize next. Welcome. I need Visual Studio for iPad. Why i must buy iMac, when i have iPad? Whats problem? Hi Andrzej, we have no plans to bring Visual Studio for Mac to the iPad at this time. I dont see a marketplace for VisualStudioMac however vscode has one. There are some great tools like the power tools and color etc that I use daily on the PC versions. Hi Barry, it is true that we do not have an open marketplace for Visual Studio for Mac today. We do have an extension gallery where we host some select extesions build by the team, but that is not something broadly available. We do want to eventually have a marketplace, where the community can easily build and share extensions across the two PC and Mac versions, but this is not on our near-term roadmap. 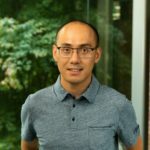 Please free to create a suggestion on our Developer Community portal (https://developercommunity.visualstudio.com) so others can also vote on this request.